Clarence A. Robinson, Jr., “China’s Military Modernizes, Declares Regional Strength—Robust Investments in Hardware, Technology, and Modern Operational Concepts Yield Benefits,” Defense (Winter 2011): 112-17. Chinese forces are emerging with capabilities of conducting military operations in Asia well beyond Taiwan. China’s reach may extend to Guam, a U.S. territory; Japan; and the Philippines. 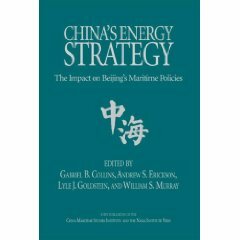 Top-level Chinese officials argue that their nation’s economic and political power is contingent upon access to and use of the sea, requiring a strong navy to safeguard access, Erickson acknowledged. The PLAN primarily is spotlighting contingencies within what senior leaders term the first and second island chains…“These island chains run along China’s maritime perimeter. The first island chain includes Taiwan, Ryukyu Islands, and the Philippines to the South China Sea. The second island chain extends from northern Japan through the Marianas, the Carolines, Guam, and the South Pacific. China, exploiting modern technologies and weapons, is positioning itself to challenge American predominance in the Asia-Pacific region…,” Erickson said. … Questions persist over how quiet the PLAN’s nuclear submarines operate, Erickson said. Acoustic levels of selected Chinese nuclear- and diesel-powered submarines published by the U.S. Office of Naval Intelligence compare [with] acoustic signatures [of] Russian submarines. This assessment reveals that China’s conventional submarines are becoming extremely quiet. “Indeed, China has two variants of the Kilo-class diesel submarine that score very well. The Type 093 and 094 nuclear-powered boats, however, are not especially quiet and the PLAN is struggling to reduce noise from their reactors,” Erickson said. Pleased with its conventionally-powered submarines, the PLAN has built 13 Song-class boats and several Yuan-class submarines, considering them much more relevant to scenarios in the near seas—the Yellow, East, and South China seas, Erickson said. The Yuan may also have an air independent power system. “They don’t need the long range of nuclear power, and quiet conventional submarines perform very well in the near seas,” Erickson said. “Perhaps we could see a J-15 takeoff and landing onboard the Varyag … by early next year . The PLAN is unlikely to rush the process, understanding how difficult and dangerous it could be. They are aware of carrier aircraft histories, and know that the U.S. Navy lost many good pilots and aircraft during carrier operations,” Erickson said. The real question with China’s aircraft carriers is what the next ship will look like. … There are inherent limitations with short takeoff and arrested-landing aircraft. Shifting from a ski-jump configuration to a catapult and arresting gear deck would provide many advantages in terms of aircraft performance—payload, range, and time on station, Erickson said. Another potent element of A2/AD is the development and deployment of a Chinese anti-ship ballistic missile (ASBM). This system of system is designed to attack a moving aircraft carrier [strike] group from long range, using land-based mobile launchers, Erickson continued. The DF-21 ASBM, with its maneuvering re-entry vehicle… has moved from concept to operational in just over a decade, he said. Space-based and land-based over-the-horizon (OTH) sensors augment ASBM targeting, according to Erickson. “Still unclear is how China’s OTH radar and ocean surveillance satellites work together, especially when the architecture is divided among various service arms. China has a less-than-stellar history in joint operations, although they are rapidly improving as they move toward real-time capabilities,” Erickson said. China continues to launch Yaogan satellites with electro-optic[al] and synthetic aperture radar sensors. At least one ocean surveillance constellation is made up of three such satellites in orbit, flying in roughly a triangular formation. … “China’s leaders may believe they require this satellite system to cue their ASBMs. The United States must think innovatively about how China will locate carrier [strike] groups, including the use of unmanned aerial vehicles and possibly fishing boats,” Erickson said. Emphasizing small satellites and low-cost boosters, the PRC rapidly is gaining the ability to increase, when needed, the number of satellites on orbit. The first PRC indigenous ocean surveillance spacecraft, the Haiyang-1A (HY-1A), went into orbit in 2002…. This satellite stores data using a solid-state memory and downloads it to receiving stations near Beijing and Sanya on Hainan Island, Erickson said. …China plans to launch a total of 15 of the Haiyang (Ocean) spacecraft over the next nine years. Eight satellites designated the HY-1C-J will be launched through 2019. The HY-2 series will employ a Ku/C-band dual-frequency radar altimeter, tri-frequency radiometer, Ku-band scan radar scaterometer and a microwave imager to monitor sea surface wave fields, height, and temperatures. Four HY-2A-D satellites will be launched every three years over this same period. The HY-3 series will use the synthetic aperture radar with 1- to 10-meter resolution and X-band radar to monitor maritime resources and coastal zones, Erickson said. 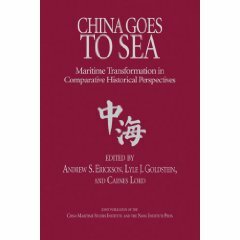 Shipbuilding and an export economy were vital factors in promoting Chinese naval developments. …these are reasons we are seeing naval missions much farther afield, “to the far seas, including counter-piracy deployments in the Gulf of Aden,” Erickson explained. “China’s leadership cites the Taiwan crisis of 1995-1996 and the 1999 U.S. bombing of the Chinese embassy in Yugoslavia as key turning points. These events spurred prioritization of PLAN developments, along with the Second Artillery Corps’ massive ballistic missile development programs, as China also seeks to use the land to control the sea,” he said. “By the late 1990s, significant technical research was under way on Chinese precision-guided ballistic missiles, and the first serious technical advances emerged in the 2000s, reflecting sophisticated research and development progress. By 2004, the Second Artillery Force’s major doctrinal handbook emerged to specifically reveal ASBM use in operational scenarios. When you connect all the data points, this was coming at us for a while,” Erickson declared. Simultaneously, there are major shifts underway as European nations… precipitously decrease their navies. “The U.S. Navy is struggling, during a difficult budget period, to remain level, in terms of platforms. The Navy requires a significant number of ships equipped with Aegis and SM-3 ballistic-missile interceptors… to meet Chinese ASBM threats. It is very important to continue developing and deploying countermeasures to China’s ASBM and other types of ballistic and cruise missiles,” Erickson said. … This situation places an emphasis on undersea systems. 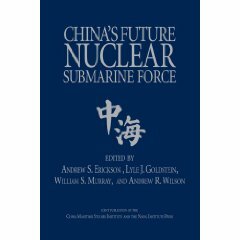 “China has little, if any, ability to track U.S. submarines, and we should fully exploit this limitation,” Erickson added. “Technology matters, but so does geography. For a long time to come, China will be influenced by its geography. The PRC will feel hemmed in by the ‘island chains.’ What they can accomplish in the maritime domain will require land-based support. China is likely to continue relying on land-based missiles and aviation well into the future,” Erickson predicted. Much less progress is being made by China in developing resources that extend global reach or power projection beyond regional waters. … The PRC will continue exploiting technology for asymmetric advantages wherever possible. Beijing’s long-term goal is to create a wholly indigenous defense industrial sector, augmented by commercial industry and foreign technology acquisition to meet PRC modernization needs, Erickson concluded. 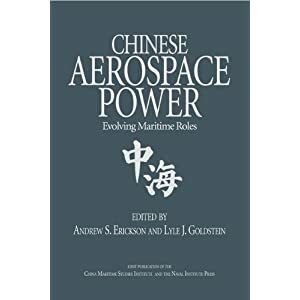 For further information on the book mentioned here, see Andrew S. Erickson and Lyle J. Goldstein, eds., Chinese Aerospace Power: Evolving Maritime Roles (Annapolis, MD: Naval Institute Press, 2011).